Ricin is one of the most deadly toxins that has been discovered. A single molecule can kill an entire cell. It's also a very common toxin. It's made by the castor bean plant, which can be found in gardens and wild areas around the world and is widely grown for the oil it produces. The seeds are laced with the toxin: about 8 beans can provide a lethal dose. 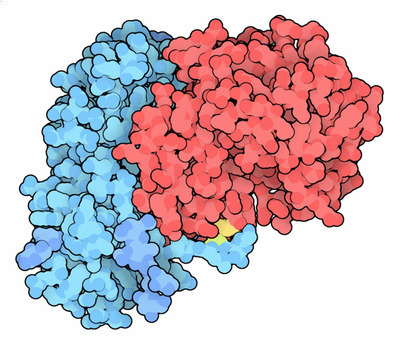 Ricin with cell-targeting B chain in blue and the toxic A chain in red. Ricin has been classified by the Centers for Disease Control and Prevention (CDC) as a serious threat for use as a weapon in biological warfare and bioterrorism. It is easily purified in large quantities from castor beans, but fortunately, it is difficult to deliver in a form that would be deadly to large groups of people. It has been used, however, in more targeted attacks. In a classic spy-thriller attack, a small metal pellet containing ricin, delivered with a poison dart fired from an umbrella, was used to kill a diplomat in London in 1978. More recently, ricin powder was found in mail addressed to senators and the White House. This is dangerous, because inhalation of fine ricin powder can be deadly. Ricin uses an effective strategy shared by many bacterial and plant toxins, as described in the previous Molecule of the Month on cholera toxin. It is composed of two chains, as shown here from PDB entry 2aai , each with a specific job. The "B" chain (in blue) is the targeting mechanism, and the "A" chain (in red) is the toxic portion. When a person is poisoned, millions of the molecules of ricin bind to carbohydrates on the surface of the cell and chaperone the toxin inside. Most of these never make it to the cytoplasm, but one is enough. A disulfide linkage between the chains (shown here in yellow) is broken, and the A chain travels through the cytoplasm, inactivating 1500 ribosomes per minute and ultimately killing the cell. Ricin attacks the Achilles heel of the ribosome: a loop, termed the sarcin/ricin loop, that is essential for interaction with the elongation factors. 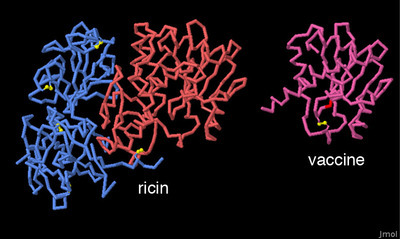 Ricin clips off a single adenine base at the tip of this loop, which is enough to inactivate the ribosome permanently. This is why ricin is so incredibly toxic: it can hop from ribosome to ribosome, destroying each one in turn, until there are no active ones left in the cell. The large subunit of the yeast ribosome is shown here (PDB entries 3u5d and 3u5e ), with the sarcin/ricin loop in yellow and the targeted adenine in red. 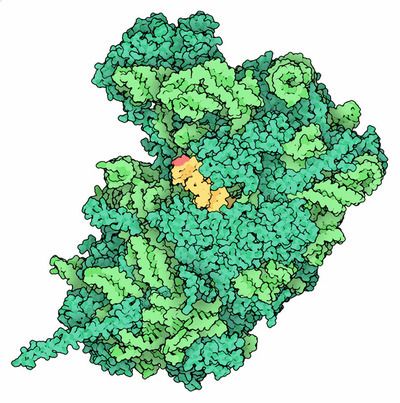 Large subunit of the ribosome, showing the site attacked by ricin in red. Ricin is deadly, but if used properly, it can also have beneficial effects. 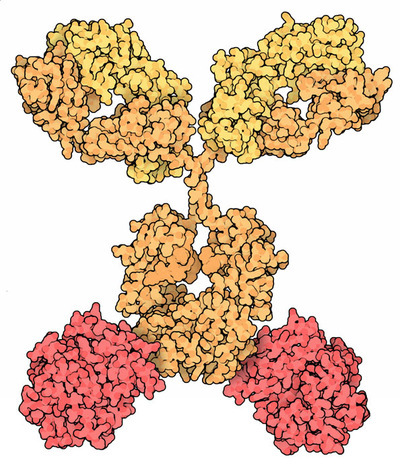 For instance, researchers have created a new type of therapeutic molecule termed an immunotoxin, which combines the targeting ability of an antibody (shown in yellow, modified from PDB entry 1igt ) with the toxicity of the ricin A chain (shown in red). The antibody is chosen to bind specifically to cancer cells, delivering the toxic directly to the pathological cells that we want to destroy. Since ricin poses a threat to our safety, researchers are working to develop methods to protect us from the toxin. The molecule shown here is an experimental vaccine that is designed to produce immunity against ricin. The vaccine is built from ricin, but with a few changes to make it less toxic. Hopefully, this type of vaccine will be used to protect people who are particularly at risk, such as the military or first responders. To compare two of these experimental vaccines (PDB entries 3srp and 4imv ) with the active toxin, click on the image for an interactive Jmol. Researchers are looking for small molecule inhibitors that bind in the active site of ricin and block its action. You can find several examples of these in the PDB. Ricin is a glycoprotein, with several carbohydrate chains on its surface, and it is stabilized by several disulfide linkages. You can view these structural features in PDB entry 2aai. R. B. Reisler & L. A. Smith (2012) The need for continued development of ricin countermeasures. Advances in Preventive Medicine DOI 10.1155/2012/149737. F. Musshoff & B. Madea (2009) Ricin poisoning and forensic toxicology. Drug Testing and Analysis DOI 10.1002/dta.27. R. J. Kreitman (2006) Immunotoxins for targeted cancer therapy. AAPS Journal 8, E532- E551. J. Audi, M. Belson, M. Patel, J. Schier & J. Osterloh (2005) Ricin poisoning, a comprehensive review. Journal of the American Medical Association 294, 2342-2351. J. M. Lord, L. M. Roberts & J. D. Robertus (1994) Ricin: structure, mode of action, and some current applications. FASEB Journal 8, 201-208.